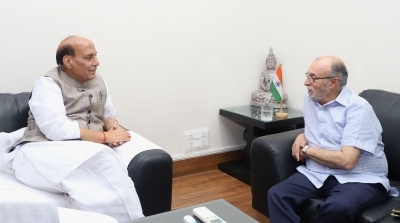 New Delhi July 12 (IANS) Delhi Lt Governor Anil Baijal on Thursday met Union Home Minister Rajnath Singh amid the row over the control of the state Services Department and a day after Chief Minister Arvind Kejriwal approached Singh on the issue. The meeting at the Union Home Minister s residence lasted for an hour said officials. Baijal along with Chief Secretary Anshu Prakash on Tuesday met Union Home Secretary Rajiv Gauba over transfer of officials.